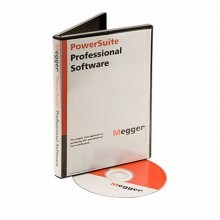 Includes: Megger PAT410 Printed quick start guide, Full user guide on CD, Continuity / earth bond lead + probe (black), Extension lead adaptor 13A, Carry case with lead/document pouch, Plug adaptor IEC C6 - C13 (3 way 5A PSU) and Screen protector. 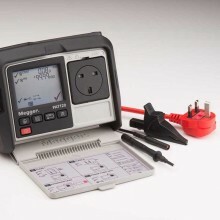 The Megger PAT410 pat tester provides a low-profile 230V only solution without the added weight required of 110 V operation, plus a database capacity for up to 10,000 test results. 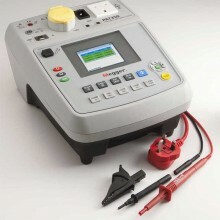 Featuring an earth bond test at 200mA (IT safe), along with a full range of 240V PAT tests, the Megger PAT410 features robust design, combined with reliability. 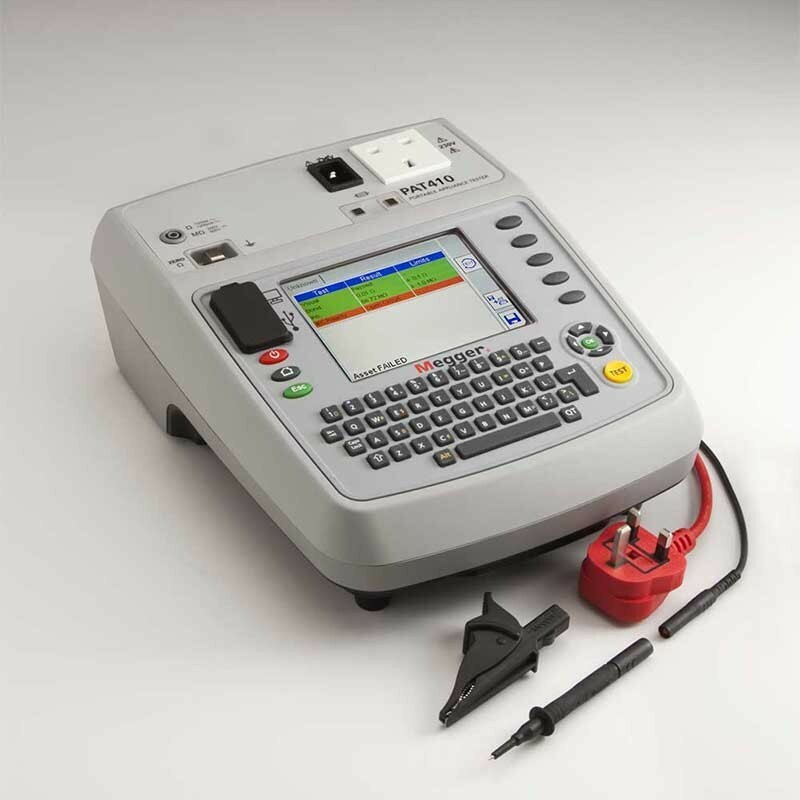 The large 5.7" colour LCD display allows for a clear, menu driven test process. 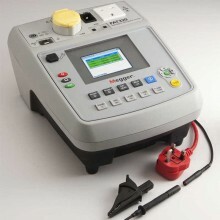 The full QWERTY keypad on the Megger PAT 410 ensures asset data and descriptions can be easily added, and that test settings can be manually adjusted. Vast on-board memory to keep you the job longer. Continuous operation, no need to stop and wait for the tester to cool down. 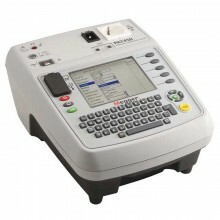 Instant re-start as you move from room to room testing. Soft keys to speed you through the testing process. Full PAT testing including RCD testing. Most productive tester in its class. PAT410, PAT420, PAT450 230 V ±10 @ 50/60 Hz. PAT420, PAT450 110 V ± 10% + 110 V ±10% @50Hz. Open Circuit Voltage 9 V AC ±10% ± 0.1 V (supply: 230 V 50 Hz). ±5% ±5 (0.5 to 0.99 Ω). 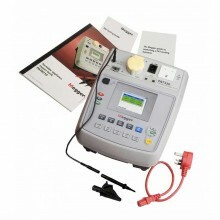 Display Range 0 to 1.99 Ω.
Continuity Test Voltage 9 V AC ± 10% ± 0.1 V (supply: 230 V 50 Hz). ±5% ± 5 digits (0.5 to 0.99 Ω). Continuity Resistance Resolution 10 mΩ (1 to 19.99 Ω). Display Range 0 to 19.99 Ω. ±5% ± 10 digits (20 to 99.99 MΩ). Insulation Resistance Resolution 0.01 MΩ. 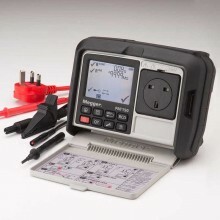 Display Range 0 to 99.99 MΩ. Test Voltage and Frequency 40 V AC ±10% nominal mains frequency. 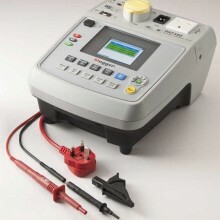 Leakage Current Accuracy ±5% ± 5 digits. 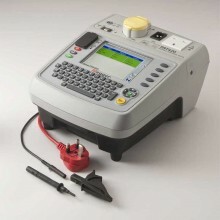 Test Voltage Nominal mains 110/230 V AC. 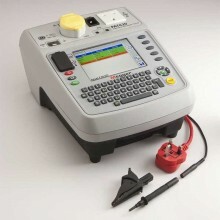 Test Frequency Nominal mains 50/60 Hz. ±5% ± 0.1 mA (0.1 mA to 0.99 mA). Display/Measurement Range 0.10 mA to 19.99 mA. 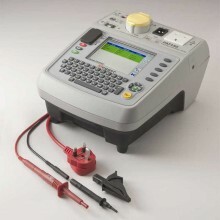 Test Voltage and Frequency Nominal mains supply. Touch Current Accuracy ±5% ± 5 digits. Touch Current Resolution 0.01 mA. Display 0 to 10 mA. ±5% ± 100 digits (1000 VA to 3700 VA). Resolution 1 VA (0 to 3700 VA). 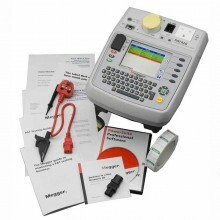 Display Range 0 to 3990 VA.
Tests Performed Bond, insulation and polarity. 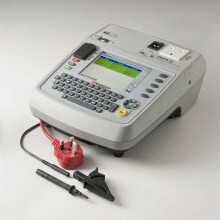 Polarity Test Voltage 12 V.
3000 V AC nominal for class 2. Flash Test Current <3.5 mA short circuit @ 253 V primary supply voltage. Flash Test Breakdown Current Accuracy ±5% ±5 digits. Flash Test Breakdown Current Resolution 0.01 mA. Display Range 0 to 3.0 mA. +2 to +8% (1 x I, 5 x I). Trip Time Accuracy ±1% ± 5 digits. Trip Time Resolution 0.1 ms.
0 to 40 ms (5 x I). Warning Audible beep if fuse is OK.
75% RH @ +30 to 50°C. Dimensions 180 (H) x 255 (W) x 320 mm (L). 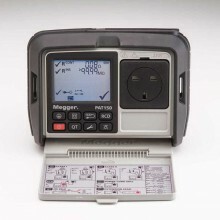 Safety IEC 61010-1: CAT II 300 V.
PDF Specifications of the Megger PAT410, PAT420 & PAT450 Portable Appliance Testers.